Trade Almost 200 Binary Option Instruments with Binary Cent! Choosing a binary options broker when starting out trading, or keeping abreast of the best brokers and conditions on the market with a view to possibly switching broker, can be quite a challenge with such a wide range of choice currently on the market. The booming popularity of binary options trading has led to a parallel boom in the number of brokers offering trading platforms. As in any industry, there is a degree of variation when it comes to the quality of product offered by different brokers. Perhaps more importantly, significant variation in the customer service provided and general reliability of brokers can be seen. In our brokers review section, we summarise the main criteria that most traders base their choice of broker on, looking at the background of companies, if they are regulated, their trading platform and its features and choices and banking and withdrawals. In this review, we take a close look at BinaryCent. BinaryCent’s bonus programme is based on cash top-up bonuses awarded when an account holder makes a deposit into their account. They are in line with industry averages but the x20 trading turnover requirement on subsequent withdrawals is less onerous than that required by many other brokers. The trading platform, an inhouse product rather than a white label from one of the major binary options trading software providers, is a good product and won’t disappoint traders. Customer support is a particular strength of this broker and live chat is available 24/7 with the nice added touch that the agent is visible via a video feed which makes the experience a little more personal. The choice of tradable assets available covers all of the main bases across asset classes with particular strength in the cryptocurrencies asset list. 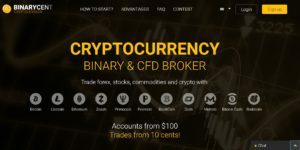 Having been established in 2015, BinaryCent can be considered a relatively newcomer to the binary options brokerage market. The broker is owned and operated by Finance Group Corp, and is registered in Vanuatu, a South Pacific tax haven. While the slightly obscure nature of the registration may be considered a drawback, Vanuatu has become popular in recent years with finance and shipping companies and can be considered as no different to a registration in any better-known offshore location. BinaryCent has seen quick traction since launching and has scooped a number of awards including Fair Binary Options’ Best Broker 2015. The broker has positioned itself as having low financial barriers to entry with the minimum deposit asked for to open an account only $100 and minimum investment stake a micro $0.1, which will appeal particularly to beginner traders. As mentioned in the introduction, BinaryCent has taken the decision to distinguish itself from the majority of binary options brokers on the market by developing its own trading platform inhouse. Most brokers take the safe option of opting for a white label version of the trading platforms built by a handful of specialist third-party providers. The move has worked out well. While it probably wouldn’t be fair to say that BinaryCent’s platform is better than the most popular trading platforms it is unique and fulfils its role perfectly well. The platform is well designed, easy to navigate and traders will find placing and managing trades convenient, which is all most require of a trading environment. In keeping with BinaryCent’s clear targeting of the beginner traders market, there is not a great deal of additional functionality added into the platform, such as more advanced trading tools, charting packages and news feeds etc. This makes it less intimidating though certain features may be considered lacking by more advanced traders. A nice touch is the fact that live video chat can be pulled up whenever a trader encounters any difficulties. The platform is browser-based so does not require the download of any software on a particular device. This provides additional flexibility and traders can sign into their account from different devices as convenient. 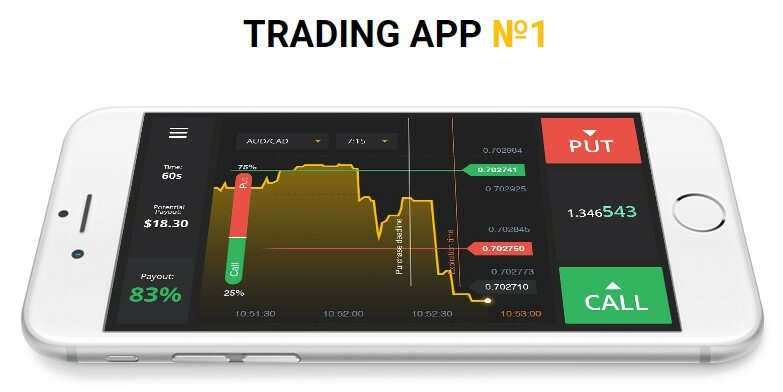 BinaryCent’s trading platform is also provided in app versions for iPhone or iPad and Android devices. The apps are well designed and there is no loss of functionality when compared to the browser-based version of the platform. The apps are free to download from the App Store and Google play, for iOS and Android devices respectively. BinaryCent provides traders with binary options based on almost 200 underlying assets with healthy selections of forex pairs, cryptocurrencies, commodities, indices and individual stocks. Particular effort has been made with the list of cryptocurrencies that can be traded and will appeal to those with an interest in alternative currencies. Bitcoin, Ethereum and Litecoin can all be traded as well as several more up-and-coming cryptocurrencies. Price quotes on tradable instruments are provided by Thomson Reuters. BinaryCent offers binary options with extremely short-term and longer-term expiries in addition to the standard 30 minutes to end-of-trading-day expiries. Short-term ‘Turbo’ binary options expire within three minutes and can be considered as akin to a ‘scalping’ trading strategy where traders look to make multiple trades, entering and exiting in seconds to minutes. Longer term expiries can be up to a year and focus more on fundamental trends than the usual shorter-term technical trends binary options tend to be based on. Binary options can be placed with a minimum stake of only $0.1. This means traders with a small budget can limit risk exposure and can gain plenty of experience on a small budget. It also means traders can spread risk effectively by opening multiple binary options positions, each with a relatively small percentage of overall trading capital on the line. Payouts offered on trades finishing ‘in the money’ can reach 90%. Fees and charges include a $10 charge applied to accounts that have had no trading activity for at least 30 days and a 5% charge applied to debit and credit card processed withdrawal requests. Withdrawals to e-wallets held by companies such as Skrill and Neteller are free. BinaryCent’s bonus scheme is comprised of two distinct categories of bonuses. The first is ‘risk free trades’, with every new account holder awarded 3. If any of their first 3 binary options positions finish ‘out of the money’, the investment stake is refunded. Cash bonuses are also added to bonuses with tiered percentages varying on the size of the deposit. A deposit of at least $250 sees a 20% bonus added, which rises to 50% from deposits of at least $500 and 100% for deposits of $3000+. The turnover requirement condition attached to bonuses is x20 before subsequent withdrawals of any winnings made on the bonus can be transferred out of a trading account. These cryptocurrencies can also be the base currency of a trading account as well as traditional fiat currencies such as $, £ and €. For fiat currency accounts, deposits and withdrawals can be made debit and credit card and most popular e-payment processors, though one drawback is the fact bank and wire transfers are not currently supported. The minimum account deposit is only $100 and minimum withdrawal $50, or equivalent in other fiat currencies or cryptocurrencies supported. BinaryCent’s stated policy is a guarantee to process withdrawals within one day. Live chat complemented by video-feed to the support agent is the primary channel of customer support though telephone and email communication is also possible. Languages support is available in include English, the other main European languages and Dutch and Portuguese as well as Arabic, Mandarin and Thai. One-on-one trading education sessions with an expert are offered as an additional feature to traders who have made larger account deposits and BinaryCent’s trading platform also has a social trading area where users can see the historical success rate of other traders who use social trading and copy trades of the most consistently successful. BinaryCent offers a pleasant and effective trading environment with a perfectly functional trading platform and strong customer service ethic. This broker will appeal most to beginners as a result of the low deposit requirement and investment stakes as low as 10 cents, as well as its simplified inhouse trading platform. While BinaryCent is not regulated, quick withdrawals processing and the fact a low account balance can be maintained offset this drawback to a large extent. The support of an extremely broad range of cryptocurrencies both for payment processing and as the base currency of trading accounts is a particular highlight of this broker and one that will win it traders. Overall, a good solid broker and particularly strong when it comes to servicing beginners, traders on a limited budget and cryptocurrency fans. What is the Minimum Deposit that Can Be Made into a BinaryCent Account? What is the Minimum Investment Stake Possible with BinaryCent? Can I Use Bitcoin or other Cryptocurrencies with BinaryCent? Yes, BinaryCent supports deposits and withdrawals in several cryptocurrencies, which can also be the base currency of a trading account.